Here’s a little something for fun. The faces! THE FACES! XD Every panel made me laugh with faces. No one’s done that to me since Awkward Zombie. I’m glad. When I can make people actually laugh, that’s about the best thing I can ask for in life. so just found your comic, i love it. i like how you have lorelei ask about some thing, making us curious about it, and then skarva just brushes her off. I can’t wait to find out more about this curse and apparent predestination of being evil. the gods here sound like jerks. Thanks so much! We’re glad to have you! Indeed, I wish we could tell you guys everything… but all in good time! You really need the “NOW KISS” guy in that picture. And here the Ecta/Davis shipping begins. There’s a feather-pen in it! Davis used it to write that note about Ecta. Almost all pens in Idenau have feathers on them. It’s not really necessary, just tradition. If it makes Victor feel better, I’m on his boat lol. Well, OK its not my least favorite thing, but its not my preferred pairing either. It IS funny to see comments though, if only because I can see the horrified faces on the two of them in my mind if they were to ever read it. And that’s worth it, lol. 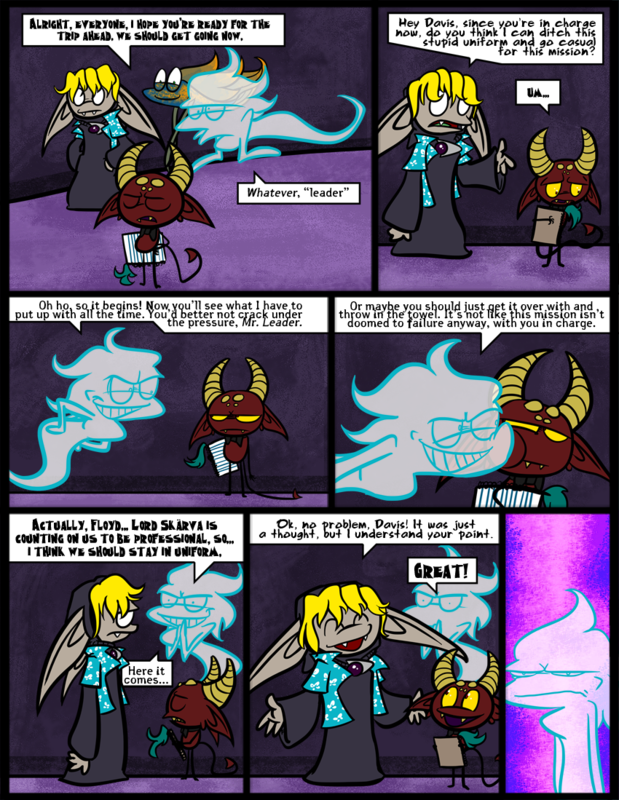 that last panel, the expression on Ecta’s face. TAKING ALL BETS! How many strips before Ecta combusts? I was thinking violently explode, but combustion works too… 5 down for seven strips not including Skärva’s arc. What is with you people and combustion? It ain’t cool you snow, it’s not all that n-ICE yeah? why not flash freezing? cold anger? Revenge is a dish best served cold? ring any jinglebells? Putting me under fire, huh? Pyre you wondering what is with people and combustion? RemEMBER this; Heat is fast, exciting, and full of life. That is what most people want. You need patience to serve revenge cold. And Ecta may be a lot of things, but patient? HAH! Hot-headed, explosive temper, that’s our Ecta! Combustion ho! But Revenge can be easily reheated, in the MICROWAVE OF EVIL! I’m trying to decide which will be more exiting, this arc or Skarva’s. Ecta’s face in the first panel is the best Ectaface ever. And Davis’s face in panel 3 is one of his best ever, lol. As one of those poor, unfortunate souls who has to wear a heavy uncomfortable uniform for school, I’m with Floyd all the way.